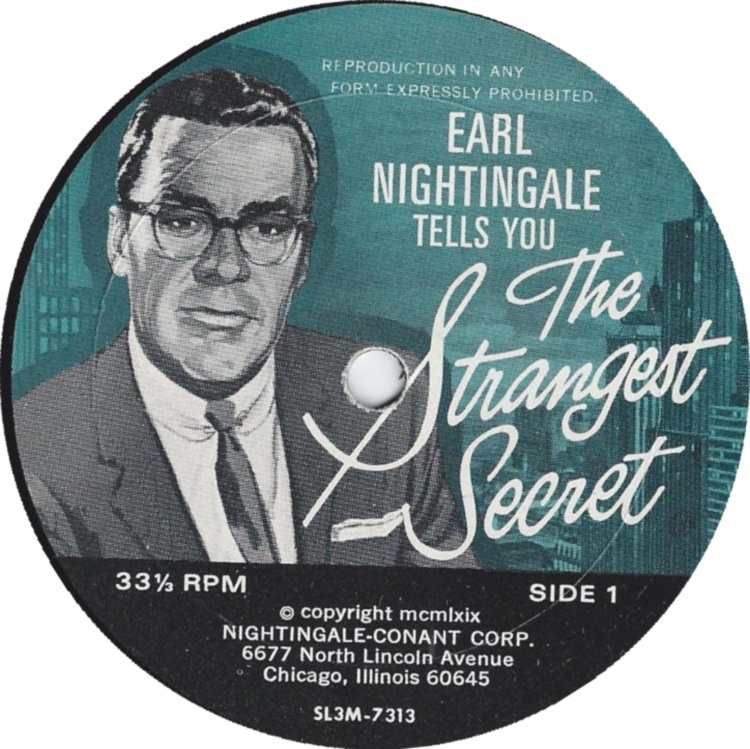 In The Strangest Secret, Nightingale shares what he believes to be the secret to success in personal development and in business. Before sharing this secret he lays down a foundation for his principles to stand on: Isaac Newton’s Third Law of Physics - For every action there is an equal and opposite reaction. To create something in your reality, you must dedicate and sacrifice some sort of action to acquire a result. 1. You Become What You Think About - understand emotionally as well as intellectually that we literally become what we think about and we must control our thoughts in order to control our lives. If you allow negative thoughts, your life will be filled with negative things. If you allow positive thoughts, your life will be positive, cheerful and successful. 2. Imagination - cut away all fetters from the mind and permit it to soar as it was divinely designed to do. This is the realization that our limitations are self-imposed and today we are surrounded by opportunities beyond belief. 3. Courage - use all your courage to force yourself to think positively on your own problem and set a definite and clearly defined goal. To let your mind think about the goal from many different angles and to allow your imagination speculate freely on many possible solutions. 4. Save - Save at least 10% of every dollar you earn. 5. Action - Ideas have little value unless we act on them. The challenge that Earl Nightingale presents is to ultimately gain control of your mind and the direction of your thoughts. It is about creating a strong habit of being more positive in general - to stop thinking about what it is you fear and every time you catch yourself thinking negatively allow the mind to replace it with an image of what it is you desire. Don’t focus on how you’re going to achieve what it is that you want, leave it up to a power greater than yourself, and instead focus on WHERE you are going. His challenge is to spend 30 days focused upon your clearly defined goal in a positive way and to train the mind into a more positive thinking pattern. Set yourself a definite goal. Write on a card what it is that you want more than anything else. Stop thinking about all the reasons why you can’t be successful. Instead think of all the reasons why you can. Trace your attitudes back through your childhood. Try to discover where you first got the idea that you can’t be successful if that’s the way you’ve been thinking. Change the image you have of yourself by writing down a description of the person you would like to be. To hear The Strangest Secret EP in full, click here.